The documents here are examples of what can be found in the physical and digital versions of the McIntosh Collection folders. At the end of each document description is a link to the folder from which the document came. Three Australian Parliamentarians, Ken Fry, Arthur Gietzelt (both Labor Party) and Senator Neville Bonner (Liberal Party) flew to East Timor in mid-September 1975 to obtain first-hand accounts of post-civil war conditions. Fry and Gietzelt visited Dili and a number of regional centres. 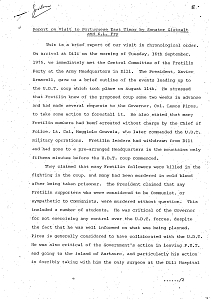 They reported on civil war events, widespread Fretilin-control of the territory and impending food shortages. They contradicted Indonesian reportage of continuing widespread unrest in the territory. 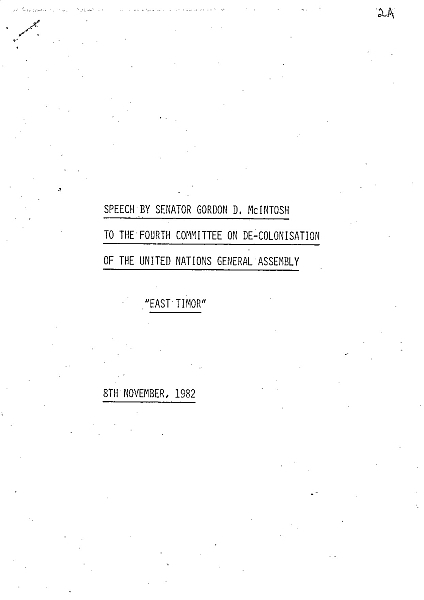 Gordon McIntosh addressed the East Timor issue before the UN Decolonisation Committee in November 1982. He was sponsored to speak by advocacy groups including the Human Rights Council of Australia, the Australian Council for Overseas Aid, the Australia-East Timor Association and Timorese communities in Australia. McIntosh's presence at the session provided a counterpoint to former Prime Minister Gough Whitlam's petition at the same hearing to remove East Timor from the United Nations' agenda. Senator McIntosh chaired the 1982-1983 Senate Foreign Affairs & Defence Committee Inquiry into 'the rights and conditions of the people of East Timor'. The Hawke Government's official response to the Committee report was dismissive of the report, comparing it unfavourably with the more recently-published report of the July 1983 Parliamentary delegation visit to Timor. In this speech to the Senate, McIntosh criticised the government response and showed how the Delegation's report confirmed the findings of the Senate Inquiry. Senator McIntosh visited the prison island of Atauro with other members of the 1983 Australian Parliamentary Delegation. 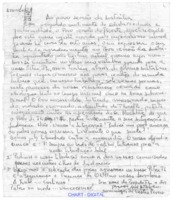 During this short stay, some tightly folded papers were surreptitiously passed to McIntosh by one of the East Timorese detainees. The papers contained two elements. The first was a letter signed on behalf of the prisoners on Atauro welcoming the solidarity of Australians, seeking their own release and of prisoners on another island and the withdrawal of Indonesian forces. The second document was a list of 73 people who had disappeared after the widely-known surprise Fretilin attack on the Dili outskirts in June 1980. The selection here includes an English translation of the smuggled documents. The formal report of the 1983 Parliamentary Delegation included records of conversation with the majority of those met by the delegation. However, the record of conversation with the newly appointed Monsignor Belo was excluded from the report. Monsignor Belo told the Delegation that Indonesia wanted to use the Church to enhance political integration but the priests did not want this role. He also said the principal problems in Timor were related to war conditions and the East Timorese were still 'living under fear'. Belo's direct comments did not find their way into the factual reporting or tenor of the Delegation's report - except for his praise of the Indonesian-appoined Governor, Mario Carrascalao. The Delegation's formal report was produced under time pressure and under strict controls by the delegation leader Bill Morrison. This pressure indicated the high political importance being attributed to the report by the Hawke Labor Government. Gordon McIntosh's eventual decision to dissent from the delegation's findings undermined the political impact of the report. McIntosh's summary criticism of the report was that it was "tendentious, superficial and at times misleading". He feared that it would "inevitably entice" readers towards conclusions about conditions in Timor which did not reflect what the delegation members actually saw. The Hawke Labor government, since its election in March 1983, largely distanced itself from the pro-Timorese 1982 Australian Labor Party (ALP) policy on Timor. The 1984 ALP National Conference significantly weakened the 1982 resolution. The formal minutes of the Conference shows the text of the resolution favoured by the Government and the successful amendment proposed by the non-factional delegate, Barry Jones. The Jones amendment included a committment to supporting United Nations and other international initiatives to solve the 'Timor problem'. In his contribution to the 1984 Labor Party National Conference debate on East Timor policy, McIntosh challenged the party to stand up for the principled position it espoused in Opposition. McIntosh argued that the greatest humanitarian need of the East Timorese was to be freed from their neo-colonial status and to freely express their own view about the future. 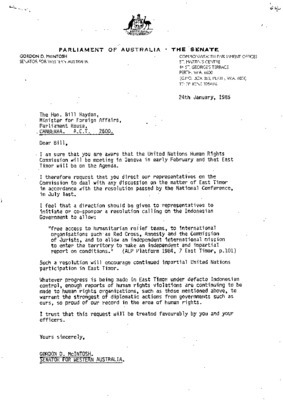 Senator McIntosh wrote to Australian Foreign Minister Bill Hayden seeking Timor human rights initiatives by the Australian delegation to the UNCHR Session in Geneva in early 1985. McIntosh then complained that the Minister's reply did not answer his question and sought a proper response to his original letter. A radio link between the East Timorese resistance and activists in Darwin was re-established in early 1985. Like similar radio operations in 1976-78, the new link was in danger of seizure by Australian officials - technically, for operating without a license. Gordon McIntosh wrote to the Minister for Communications in support of a license application by the Australian Coalition for East Timor (ACET) to operate the radio link legally. McIntosh also encouraged his parliamentary colleagues to do the same. The Minister rejected the license application, forcing the activists to operate the link clandestinely. 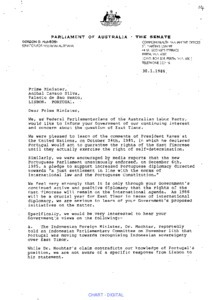 In early 1986, over 30 Labor Party federal politicians wrote to the Portuguese Government to express their continuing concern about East Timor and to seek information on Portugal's future diplomatic activity. The reply from the Portuguese Prime Minister, Anibal A. Cavaco Silva, is notable for its direct criticism of the Australian Prime Minister Bob Hawke's August 1985 statement on Indonesian sovereignty over Timor and Australia/Indonesia activity on the 'Timor Gap'. McIntosh's speech before the Senate on 20 March 1986 challenged the legality of Australia-Indonesia negotiations on the seabed boundary south of East Timor. His argument drew on specific United Nations resolutions on Timor and earlier UN resolutions concerning territorial acquisition by force. The leader of the Labor Government in the Senate, Gareth Evans, rejected McIntosh's argument. The animated and irritated nature of Evans' reply is partly evident in the written transcript.